Trifecta 800 - 3D Printer — R&M Letter Graphics, Inc. While other printers are made to appeal to a wide variety of markets, the focus of the Trifecta™ 800 3D Printer is exclusively on enhancing K-12 students’ education. Curious learners will love the open design for better viewing during prints, educators will appreciate the printer’s light weight and small footprint for ease in moving from desk to desk, and environmentalists will admire the filament’s biodegradable properties. 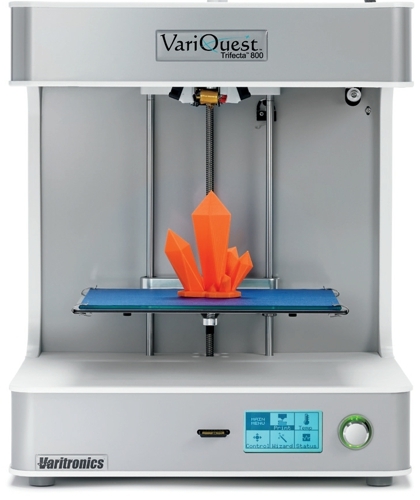 Bring your lessons to life with the VariQuest Trifecta 800 3D Printing system. Incorporate STEM and 3D printing into school curriculum with content that's aligned to national and state standards. Instill real-world critical thinking and innovative problem solving. Address the needs of kinesthetic, visual, and auditory learners. Engage students with whole-brain experiences that combine left-brained analysis tasks with right-brained visual perception learning. Amplify the value of makerspaces by connecting curiosity with curriculum. Incorporate STEM activities into core subjects. Aligns with applicable state and national standards, including Common Core, ISTE, NGSS, 21st Century, CTE, and state specific standards. Everything needed to teach, including teachers’ guides, step-by-step presentations, lesson plans, and relevant software. Digital content fits all devices, and can be downloaded as printable PDFs. Initial teacher training, professional development, IT support, and year-round customer support. Projects, lessons, and challenges can be accessed by every teacher and student within a school for the duration of the subscription.